Today, confirmation hearings begin for William Pelham Barr as U.S. Attorney General, a position he held from 1991-1993 under George H.W. Bush. Top of mind among Senators are Barr's statements about the Mueller investigation contained in an unsolicited 20-page memo he wrote in June 2018. To the extent those statements tell us something about his views of the powers and duties of the special counsel, and the relationship between the Justice Department and the Special Counsel, it might be worth consulting the drafter of those regulations - Neal Katyal, who served that role as a 29-year old new lawyer in 1999 working for Janet Reno (and later served as acting Solicitor General under Obama). 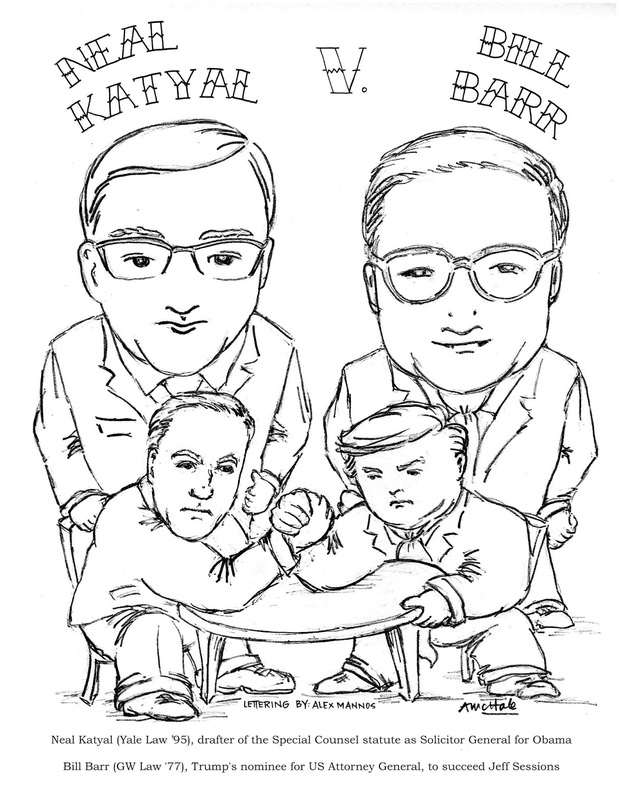 They will not directly square off, of course - Katyal is a professor at Georgetown Law and is also in private practice, while Barr, if he doesn't recuse himself, will be overseeing the Mueller investigation. Deupty AG Rod Rosenstein, who has been supervising the investigation since Sessions' recused himself in March 2017, anticipates leaving after Barr is confirmed. Barr's statement, released Monday, is mostly reassuring, in that it reiterates his friendship and regard for "Bob" Mueller, and promises as much "transparency" as is "consistent with the law." 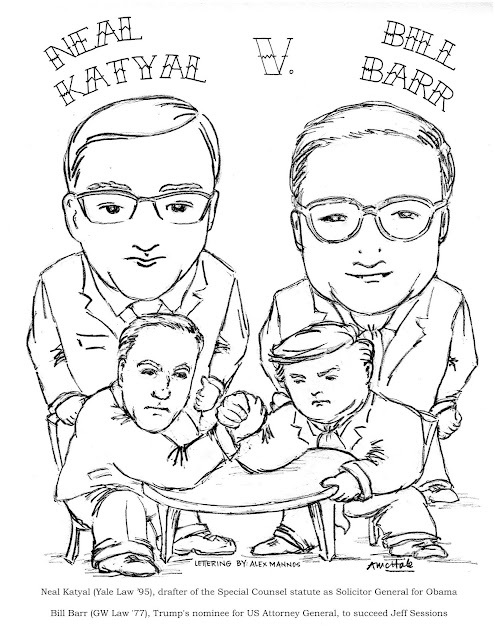 At the same time, we can probably anticipate even more frequent appearances on MSNBC by Katyal (like this, this, and this), should Barr's supervision of Mueller raise concerns about the genuineness of his commitment to the rule of law. Neal Katyal went out of his way to support Neil Gorsuch (even introducing him to the Senate Judiciary Committee) so I never quite know how he will come up regarding Trump nominees. Maybe, he only supports nominees in slots stolen from Obama nominees.